This blog looks at why it’s important to regularly clean your bird feeders and table. A rapidly spreading and fatal disease is decimating populations of Greenfinches and Chaffinches. Trichomonosis - A killer in your bird feeders? Feeding the birds in your garden is a wonderful thing to do. Not only will you be able to help them survive the long winter months, but in return you will get privileged views and the chance to watch their often amusing and endearing antics. However, it is important to remember to clean the bird table and feeders regularly. Although it may seem like an unnecessary chore, regular cleaning will save birds’ lives. Why do I need to clean bird tables and feeders? Recently a nasty disease common in pigeons and doves has spread to other birds. 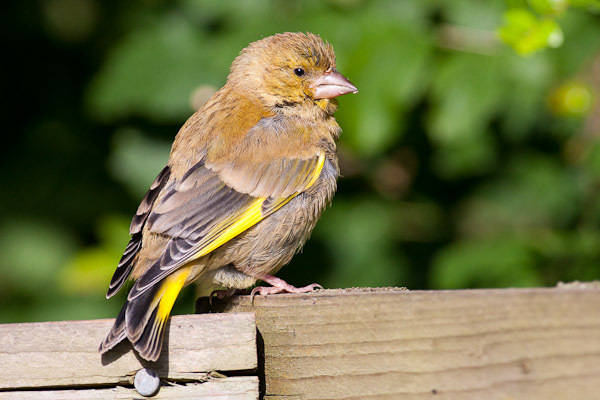 Called Trichomonosis, and caused by a parasite, the disease primarily affects greenfinches and chaffinches and has caused Britain’s greenfinch population to crash. It’s non-transmissible to humans but will spread rapidly within local bird populations frequenting the same feeding stations. Once infected, the bird will invariably die since the disease prevents it from swallowing. Signs to look out for include puffed up, sluggish individuals. Often, the infected birds will linger around the feeding station all day and will be reluctant to fly away when approached. The disease is passed on through saliva or droppings and so the cleaning of feeders and your bird table with hot soapy water and a mild disinfectant will help to reduce infection rates. The parasite cannot tolerate drying out so always try to keep your feeders (particularly the food within) dry. If you notice the food is damp or debris is building up empty the remaining food into a bag and dispose of it. The disease is also known to be spread commonly through water so if providing a bird bath, empty, clean and refill it daily. In my garden I have found feeding sunflower seeds in tall feeders to be a problem. The greenfinches adore them and will often be out in the garden all day in small flocks. However, it is precisely their close-knit social habits and the fact that seed feeders have very small, concentrated points of access to the food that leads to the disease being spread. After a month or two of feeders being up I start to see an increase in the number of sick birds. I have since stopped providing food in this way. In place of these feeders I now put food openly on the bird table and ground. Birds tend to linger less on the open tables and will often grab a seed and fly off to consume it in cover before returning. This leads to less waste building up and happier, healthier birds. Another key is to regularly move your feeders around. If that’s not possible then try to clean beneath them. For example, if you feed over patio slabs then wash them down with mild disinfectant when you clean the feeders or, if feeding over bare earth, regularly dig it over.